When it is a matter of creating an interior design project, we mainly focus on the choice of furniture overall, the style of the furniture, the arrangement of the various pieces and the colours. However, we often forget to make optimum use of the appearance of the floor, the primary component of every space, that deserves the right care and attention in a both a practical and aesthetic sense. In this sense, it is possible to introduce accessories that make contact with the floor more pleasant, enhancing it, i.e. rugs and carpets. These are design elements for the home provide floors with comfort and elegance and can be placed in the various rooms of the home, but it is in the living room that they become the undisputed protagonists of style. The living room is the place where you receive visitors and where your friends spend their time with you. Therefore, make a declaration of style and practicality to your guests in this room, with classic, refined living room rugs and carpets. How? 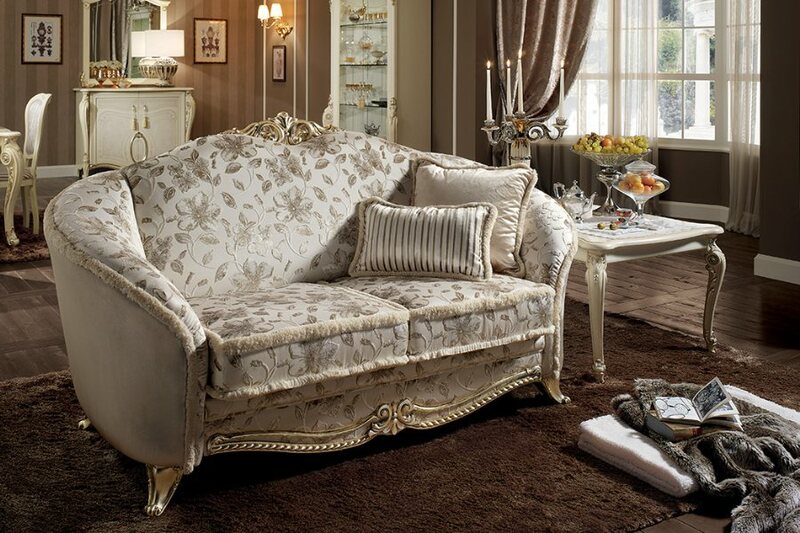 By choosing excellently made fabrics, embroidery created perfectly and decorative touches that provide beauty and exclusive originality to your living room. Before selecting fabrics and the textures of rugs or carpets to be placed in the living room, however, there are other important steps to take. We will take a look and analyse the 3 essential steps, that if followed in order and consistently, will have a positive on your choices. The matter of size affects both rugs and carpets. The main difference between the two is that, respectively, one covers varying portions of the floor while the other completely covers the floor, from one wall to the other. Having an incorrect perception of the rooms may lead you to choose the sizes of living room rugs and carpets that are not proportional to the space available. In any case, whether it is a rug or carpet, the choice of most suitable size for the spaces should be made in particular based on the measurement of the living room, and on its specific use, and on the items of furniture that fill the area. A living room is furnished with chairs, table, sideboards and glass cabinets. These are items that, if matched with carpets and rugs of the right size, will form an extremely high expression of style and search for comfort. 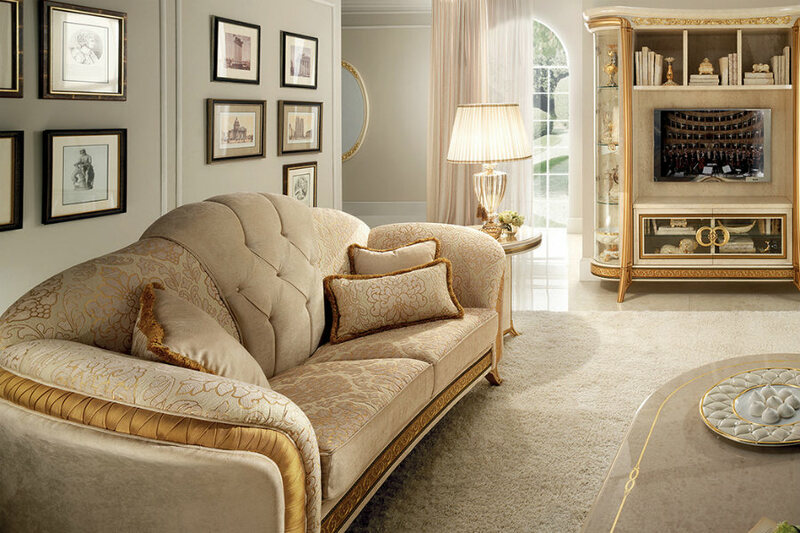 Let's take the “Melodia Collection living room” for example, where the gold and white hues of the furniture and fabrics conjure up the essence of Italian spirit for the love of classic, rich furniture. In the middle of the living room, we can find chairs and a table, while glass cabinets and sideboards are placed next to the walls. You could choose a wall-to-wall carpet or lay down a large rug under the table and chairs that dominate the centre of the room. 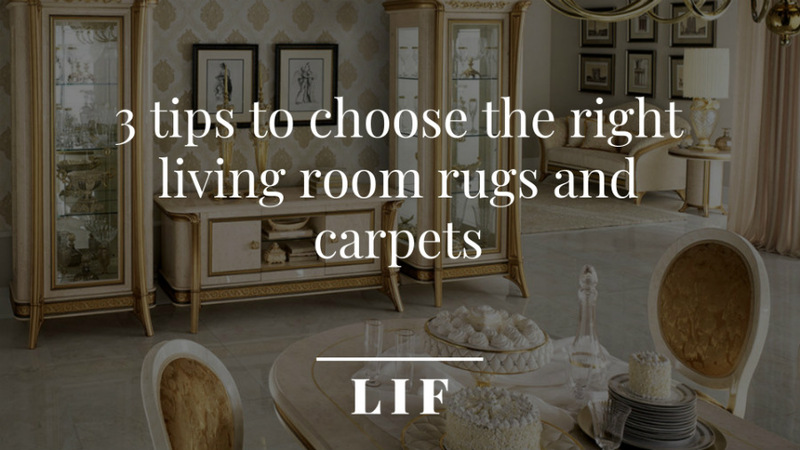 How do you choose the colour of living room rugs and carpets correctly? On this matter, we would recommend that you stay with the same chromatic colour scheme used for the living room furniture, perhaps preferring block colour textiles, or like in the case of Melodia in white and gold. How much does the thickness of rugs and carpets influence comfort and style? Rugs and carpets which are not as thick are the result of a more consistent and intricate process, therefore they are not as soft to the touch and their texture is more complex and sought-after. In this case the decorative aspect of the carpet is exalted, while the practical aspect is less so. The thicker the carpet or rug, the higher the degree of their comfort. This does not mean that these types are less sophisticated, to the contrary. It is simply a matter of searching for the thickness that is most suited to the living room overall and the use that is made of it. The choice of thickness for living room rugs and carpets depends on your personal preferences. This is the last decisive step for completing your living room furnishing, choosing carpets and rugs created with refined, high quality materials. 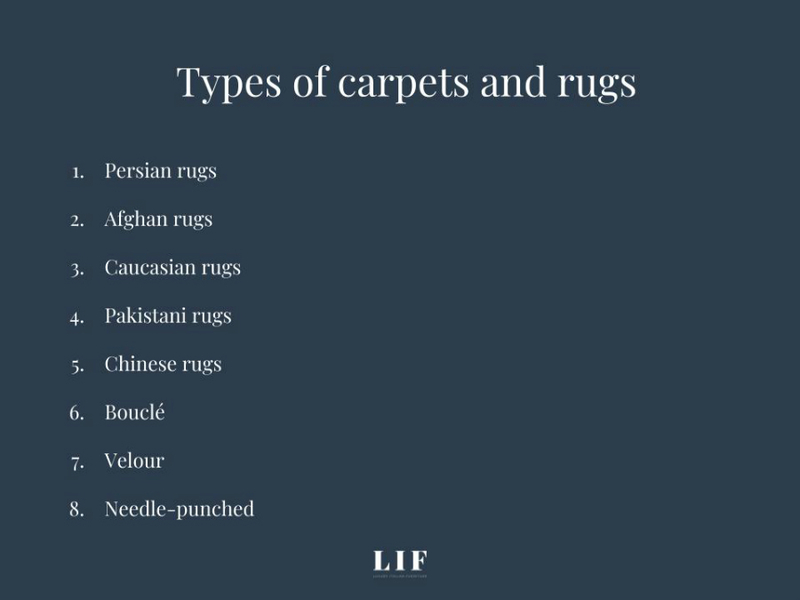 Talking about living room rugs and carpets inevitably leads to reasoning about materials and secondly about colours, embroidery and decorations that arise from processing each raw material. Generally speaking, we can divide materials into natural or synthetic, but we tend to prefer the former for the product’s inherent quality. Here are the main materials used for a rich, elegant environment. Wool: a soft, warm, robust fibre, that is one of the highest quality natural materials for a rug, being perfect sumptuously decorated rooms. It can be worked in different ways to obtain different effects. Silk: stands out for finesse and quality, but is delicate and should be used in rooms where there is no heavy footfall. It permits a large range of weaves and inlays, that provide wonderful effects for the eyes and touch. Animal skin: robust, soft and natural, a daring, eccentric choice for most people. Natural and synthetic fibres are also used to make carpets. Depending on the type of product, we can divide the characteristic types of rugs and carpets into categories. The names of Persian carpets comes from some of the most important towns for production. For example Hamadan rugs and Nain rugs, to name a couple. The main characteristic that distinguishes Persian rugs from other types is the hand knotting technique and the high number of knots. The central medallion is the distinguishing feature placed at the centre of Persian rugs. Octagonal patterns and göl are the typical decorations of Afghan rugs. They are of excellent workmanship made with Persian knots, and are recognisable by their dark red colour. The material used for the warp of this type of rug is cotton. The decorations follow the vertical, horizontal and diagonal lines and join up with geometric and floral patterns. These are made from wool and have a high density of knots. Pakistani rugs are made with open knots, a special technique that helps to alter the tone of colour when viewed. Pakistani rugs are typically red. Chinese rugs are separated into antique rugs and more recent rugs. Antique rugs are quite thick, due to the presence of larger knots. The more modern rugs are knotted using an asymmetrical technique. We can find religious symbols on antique Chinese rugs, while the more modern rugs have floral decorations and inlays that lend a three-dimensional appearance to the item. This is a soft, comfortable carpet suitable for the living area and areas with a heavier footfall in the home. Soft and velvety, this is the most valuable type of carpet. It is suited to the bedroom and areas of the home used for receiving people. A needle-punched carpet is distinguished by its flexibility and robustness, and so is suitable for areas with a frequent footfall. 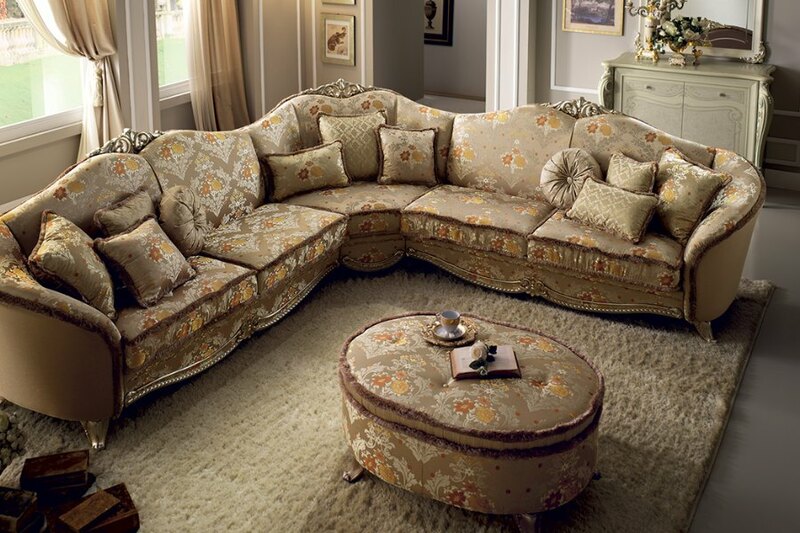 Textiles add a personal, unique touch to furnishings in various areas of the house. The living room, an area where you can unleash your creativity and desire to amaze, is no exception. You could place refined rugs in the most suitable spaces or lay down a soft carpet. The importance of introducing these two furnishing elements lies in their ability to aesthetically enrich the room, without surrendering the possibility of having a completely comfortable living area.